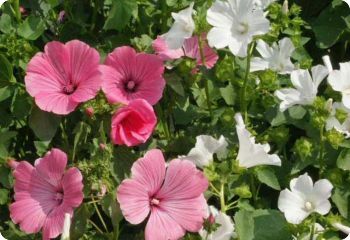 Lavatera trimestris Mix blooms in midsummer with large, cup-shaped flowers in shades of pink, rose and white. It's a popular cottage garden flower. Rose Mallow is often combined with cleome, which matches its cool colors and contrasts with its round form. It also looks good with many other annuals and perennials in the garden. Lavatera trimestris is a showy annual with large, cup-shaped flowers that bloom in shades of pink, rose and white in midsummer. Start lavatera seeds indoors 6-8 weeks before the last frost date. Or sow outdoors after the last frost. Barely cover with soil. Full sun. Spacing 12". 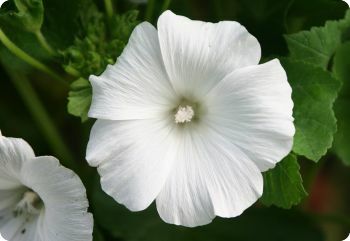 Lavatera 'Mont Blanc' is an elegant flower. The bushy plants produce lots of large, pure white blooms. It's a Fleuroselect award winner. Mont Blanc lavatera goes with practically everything, making it a good filler between large perennials and a mainstay of the annual garden. Lavatera 'Silver Cup' has large, glowing pink flowers with deeper rose veins. The prolific flowers cover the bushy, compact plants. The warm pink color of Silver Cup lavatera works well in warm color schemes. Combine it with white, blue, red, orange, yellow or gold flowers. Lavatera trimestris 'Silver Cup' won the Fleuroselect Gold Medal in 1979. It also gained the Royal Horticultural Society's Award of Garden Merit. Lavatera 'Tanagra' is a stunning new selection with deep rose-pink flowers that attract bees, butterflies and hummingbirds. Lavatera is a hardy annual that repeat blooms if deadheaded. Let it reseed for new plants the following year.